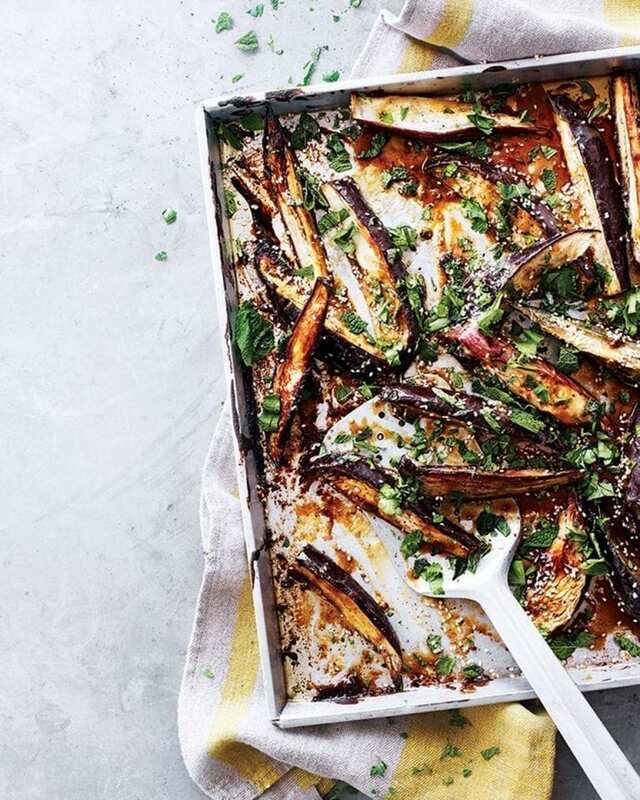 Gooey caramelised miso and sesame-baked aubergine wedges are finished with the sweet-sour tang of pomegranate molasses to make this moreish vegetarian side dish. Heat the oven to 200°C/180°C fan/gas 6. Mix all the dressing ingredients together in a large bowl, then add the aubergine wedges and toss to coat well. Transfer the aubergines and dressing to a large roasting tray, drizzle over a little oil and season with salt and ground black pepper. Roast the aubergines for 35-40 minutes until golden, sticky and soft. Meanwhile, toast the sesame seeds briefly in a dry frying pan until pale golden. When the wedges are cooked, arrange on a serving platter. Drizzle with the pomegranate molasses and scatter over the sesame seeds and fresh chopped herbs. Serve with a dollop of yogurt if you like. To make this a main-course salad rather than a side dish, serve with sliced cucumber, pomegranate seeds, torn buffalo mozzarella and fresh rocket leaves. Add a sprinkle of aleppo pepper (or regular chilli flakes) for extra kick.